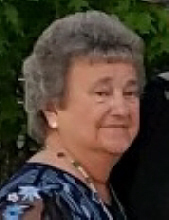 Delores “Fuzzy” E. Dennis, 77, of 92 Hadley Rd. Apt. 207, Greenville, (Hempfield Twp. ), PA, formerly of Meadville, passed away following an extended illness at 1:04 pm on Wednesday, April 3, 2019 at UPMC Presbyterian Hospital in Pittsburgh. She was born in Meadville, PA on August 15, 1941 to the late, John A. and Sophia (Centko) Holeva. Delores was a member of St. Michael Roman Catholic Church in Greenville. She attended Meadville schools and worked as a waitress at several restaurants in the Meadville area. Delores also worked at Wal-Mart in Meadville as a deli clerk until she retired. She enjoyed garage sales, bingo, casinos, and spending time with friends and family. Delores was a loving mother and grandmother. She was also a strong-willed woman who was inspirational to all who knew her. Delores is survived by: four children, Frank A. Schlosser, and his wife, Priscilla, of Saegertown, PA, Tina M. Perkins, and her husband, Kevin, of Greenville, PA, Bob Dennis, and his wife, Krystee, of Meadville, PA, and Christi Lee Ruffing, and her husband, John Douglas, of Greenville, PA; nine grandchildren, Olivia, Andrea, Richard, Randall, Joshua, Celina, Breanna and Austin, and Carolyn; four great grandchildren, Joey, Carlyann, Kayla, and Aubrianna; and one sister, Anne "Mickey" Allen, and her husband, Chuck, of Quakertown, PA. In addition to her parents, she was preceded in death by: three sisters, Marie Troutt, Madeline Barry, and Patricia Holeva, one brother, John Holeva, and former husband, Stanley "Ike" Dennis. A memorial service will be held at St. Michael Roman Catholic Church, 85 North High St., Greenville, at 10:00 am on Monday, April 8, 2019, with Fr. David Foradori, Pastor, of the church, officiating. Burial of the cremated remains will be held later at St. Brigid Church Cemetery, Meadville, PA. In lieu of flowers, memorial contributions can be made to: American Heart Association, 840 Southwestern Run, Youngstown, OH 44514. Messages of sympathy, stories, and photos can be shared at: www.osborne-williams.com. Arrangements are under the direction of: OSBORNE-WILLIAMS FUNERAL HOME AND CREMATION SERVICES, INC., 73-75 Columbia Ave. Greenville, PA 16125. Cremation will take place prior to the service. To send flowers or a remembrance gift to the family of Delores "Fuzzy" E. Dennis, please visit our Tribute Store. "Email Address" would like to share the life celebration of Delores "Fuzzy" E. Dennis. Click on the "link" to go to share a favorite memory or leave a condolence message for the family.